This attractive, 6-lb. 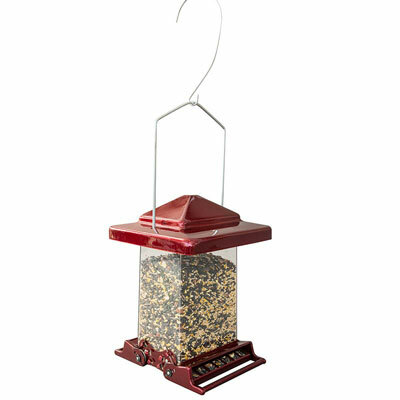 capacity feeder is designed to feed the birds—not the squirrels. Two counter balanced perches adjust to three positions (see weights for each position below), so you control how much weight closes the perches. And, with the no-waste perching area, you'll have less seed on the ground. Birds can access the hopper on both sides. Monitoring the seed level is easy—thanks to the clear view panels on all four sides. Constructed with bright red powder-coated steel on top and bottom, this feeder will add a splash of color to your yard! Zinc-plated steel hanger included. 12.75"H x 9.75"W x 9.12"D.